Actor. Presenter. Angler. Writer. Flytyer. Welcome to ‘STUFF’ my video magazine! When I appear at fly-fishing and vintage tackle shows, many of the questions I’m asked fall into distinct categories. So I’ve put together these little videos that will hopefully answer most of your queries. 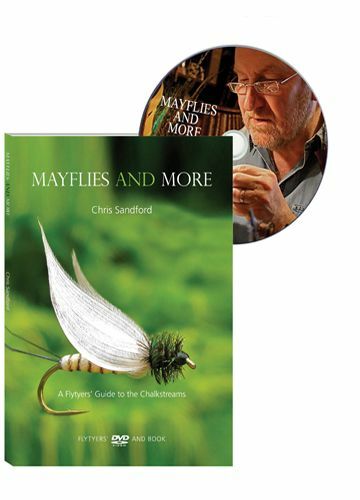 In this series, I’ll demonstrate how to tie some of my flies and the materials I use, plus the tips and tricks I’ve gathered over the years that I’m more than happy to share. I’ll also show you some interesting examples from my vintage tackle collection. 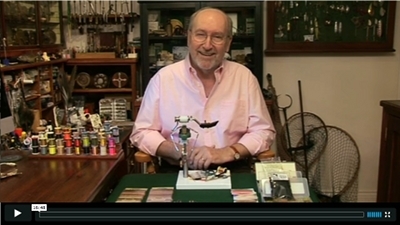 To read more about my ‘STUFF’ and watch the videos, click here for Episodes 1 thru 10. To keep up to date with all my news – Sign up now! I’ll Keep You Posted! 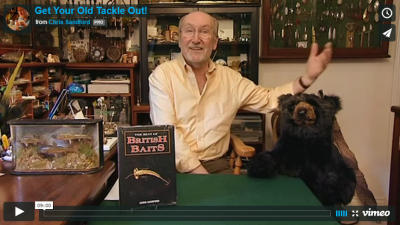 Thinking of starting your own vintage tackle collection? Wondering what that bit of old tackle’s worth? Both the article and the show will not only give you a financial insight into what’s hot and what’s not in the world of vintage tackle, but will guide you along the tricky path of starting your own collection. I’ll show you a whole creel full of vintage tackle that made a fortune. An Irish rod and reel that fetched £1,500, a tiny lure that made nearly £3,000 and a Hardy reel that went for £15,000!